by Eugen Rosenstock-Huessy. Scientia Verlag, 1965. 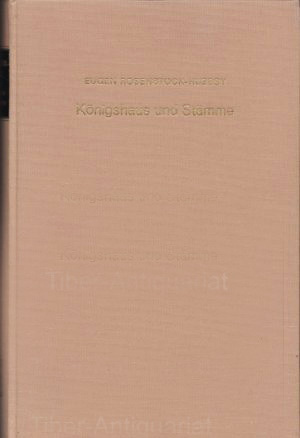 Königshaus und Stämme outlines the development of royal houses and the household system of the royal families, the aristocracy, as a form of constitutional law. This constitutional system went beyond the bounds of the tribes involved, which were often at loggerheads with one another. Building on the principles outlined in Königshaus und Stämme, Rosenstock-Huessy later developed the theory that the power of royal houses to found constitutional systems was the deep secret of empires, from ancient Egypt over Charlemagne to the League of Nations.